The long legs and bill of our quiz bird look good for a wader or shorebird of some kind. None of our herons or egrets have such a thin decurved bill, and the warm brown plumage and spotted upperparts aren't right for an ibis. It seems fairly obvious that we're dealing with a shorebird and a large one at that. The decurved bill and large size eliminate all shorebirds except for the curlews. Three of these large sandpipers have been recorded in Illinois: Eskimo Curlew, Whimbrel, and Long-billed Curlew. The bill of our quiz bird is definitely too long for an Eskimo Curlew (which is probably extinct anyway), and probably too long for a Whimbrel, but to play it safe we need to look at the head. Whimbrels have distinct, bold stripes on their heads while Long-billed Curlews have plainer heads without striping. 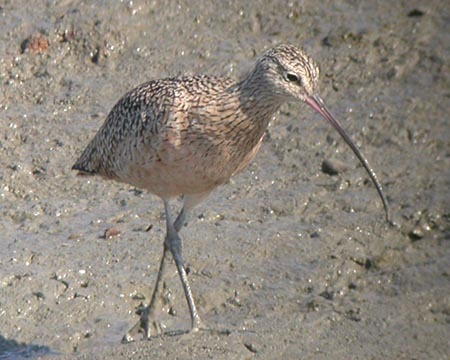 Our quiz bird has a rather plain head that lacks striping and is therefore a Long-billed Curlew. This obliging Long-billed Curlew was photographed by Jill Anderson on October 14, 2006 in Palo Alto, California.